SPEAKING ENGLISH WITH a Slavic accent, a man known only as “John Smith” because he does not remember his real name is proving a mystery for Norwegian police. 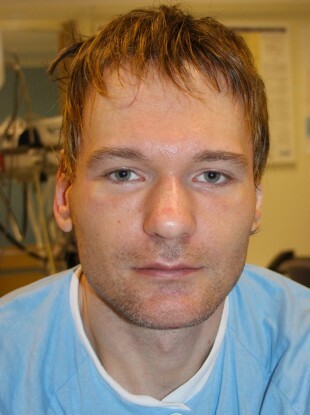 The tall, young amnesiac was found helpless in the snow near a car wash in Oslo last December. How he got there, and from where, he has no idea. “What apparently has happened is that I was robbed, I was for sure sexually assaulted, and then I was thrown onto a street in Oslo,” he said today. “What might have happened is that they took advantage of the fact that Europe has open borders — this amazing European invention — and that they basically used Oslo as a garbage place to dump me,” he said, without knowing who “they” are. Police refused to comment on the more personal aspects of his testimony, but it is the violent and sexual crime unit that has been put in charge of the investigation. “Maybe I was too trustful. Maybe I let some people too close to me and they had some fun with me,” said “John Smith”. The man, who is 6 feet 1 inch with blue eyes and dark blonde hair, speaks good English with an Eastern European accent and understands Czech, Slovak, Polish and Russian. Which of these is his native language is anyone’s guess, including his own. But he says he “thinks and dreams” in English, and so thinks he may have spent some time in an English-speaking country. Aged about 20, “John Smith” was in a very weak condition and poorly dressed for the severe Norwegian winter when discovered in December. “I had on my wrists very big, very bloody traces of plastic strips that they use to tie up cables … It was so tight that even now you can still see spots on my wrists,” he said. Police initially turned to international police organisation Interpol and more than a dozen nations to compare fingerprints and DNA with their databases to unravel the mystery, but in vain. No closer to a solution, law enforcers took the extra step on Tuesday of releasing the man’s photo to the public, in the hope of finding new clues. “We have received information from Norway but also from other countries and we find some of that information very interesting,” Oslo police spokesman Sturla Henriksboe told AFP. “It’s particularly from the Czech Republic that we have received information,” Henriksboe said. While “John Smith” remembers nothing about himself, he is sure of one thing: he is a stranger in Norway. “I don’t think I’ve ever been here before in this country,” he said. I don’t think I came to this country out of my own free will because I’m used to a very different weather, a much warmer weather. The weather here is basically hurting me. Email “Norway police try to identify man with no memory (but who speaks five languages) ”. Feedback on “Norway police try to identify man with no memory (but who speaks five languages) ”.